Does a young person commit suicide every thirteen minutes in the United States? Are four million women really battered to death by their husbands or boyfriends each year? Is methamphetamine our number one drug problem today? Alarming statistics bombard our daily lives, appearing in the news, on the Web, seemingly everywhere. But all too often, even the most respected publications present numbers that are miscalculated, misinterpreted, hyped, or simply misleading. This new edition contains revised benchmark statistics, updated resources, and a new section on the rhetorical uses of statistics, complete with new problems to be spotted and new examples illustrating those problems. Joel Best’s best seller exposes questionable uses of statistics and guides the reader toward becoming a more critical, savvy consumer of news, information, and data. 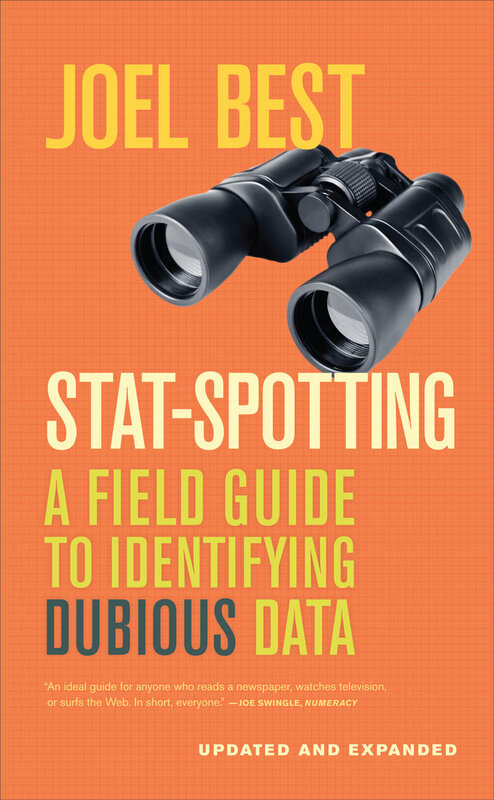 Entertaining, informative, and concise, Stat-Spotting takes a commonsense approach to understanding data and doesn't require advanced math or statistics. Joel Best is Professor of Sociology and Criminal Justice at the University of Delaware. Among his many books are Flavor of the Month: Why Smart People Fall for Fads, More Damned Lies and Statistics: How Numbers Confuse Public Issues, and Damned Lies and Statistics: Untangling Numbers from the Media, Politicians, and Activists, all from UC Press. D. SOURCES: WHO COUNTED–AND WHY? E. DEFINITIONS: WHAT DID THEY COUNT? F. MEASUREMENTS: HOW DID THEY COUNT? G. PACKAGING: WHAT ARE THEY TELLING US? H. RHETORIC: WHAT DO THEY WANT US TO THINK? I. DEBATES: WHAT IF THEY DISAGREE?